Our transition to the highly-connected realm of Platform 3.0 will radically disrupt the way that we approach Enterprise Architecture (EA). The current architectures and methodologies will simply not hold up in the era of Platform 3.0 - characterised by the forces of big data, mobility, the Internet of Things, and social media colliding. In the Platform 3.0 era, power shifts to the customer - as we choose from a range of services offered conveniently via digital channels. By embracing Platform 3.0, organisations can respond to newly-empowered customers. New entrants can scale at unprecedented rates, and incumbents can pivot business models rapidly, while entering and exiting new markets as opportunities emerge. EA plays an essential role in making these possibilities a reality. EA infuses IT into the DNA of the business. No longer is it about ‘IT’ and ‘business’. Technology is absolutely integral to the entire business, and business leaders are quickly realising the fundamental truth that ‘if you can’t change the system, you can’t change the business’. 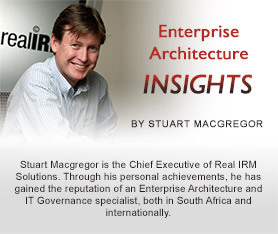 A new and exciting Platform 3.0 architectural reality is emerging. It’s composed of micro-services and platforms that are combined in radical new ways to serve point-in-time needs – powering new-found business opportunities and revenue streams, dramatically transforming your organisation. But, while driven by an urgent need to transform, to become faster and more agile, large organisations are often constrained by legacy infrastructure. With an EA-focused approach, organisations can take a step back, and design a set of architectures to manage the volatile change that’s inherent in today’s quickly-digitising industries. EA allows business systems in different departments to be united, creating what The Open Group (the vendor-neutral global EA consortium) aptly describes as a “boundaryless” flow of information throughout the organisation. Platform 3.0 refers to a radically different ways for the organisation to securely engage with partners, suppliers, and others in your value chain or ecosystem. For a retailer, stock suppliers could access real-time views of your inventory levels and automatically prepare new orders. Or a factory, for example, could allow downstream distributors a view of the production facility, to know when the latest batch run will be ready for collection. In almost every industry, there are a number of new disruptors offering complementary service offerings to incumbent players (such as Fintech players in the Banking industry). To embrace partnerships, venture-capital opportunities, and acquisitions, organisations need extensible architectural platforms. More and more transactions are moving between organisations via connected, instantaneous, automated platforms. We’re seeing the fulfilment of The Open Group’s vision of boundaryless information that flows between organisations and fuels greater efficiencies. We need to architect for an uncertain future, resigning ourselves to not always knowing what will come next, but being prepared with an architectural approach that enables the discovery of next-generation digital business opportunities. By exploring open standards, this transformation can be accelerated. The concept of ‘openness’ is at the very heart of Platform 3.0-based business transformation. As different business systems fall into and out of favour, you’ll want to benefit from new innovations by quickly unplugging one piece of the infrastructure, and plugging in a new piece. Open standards allow us to evolve from our tired and traditional applications, to dynamic catalogues of microservices and APIs that spark continuous business evolution and renewal. Open standards help up to reach a state of radical simplicity with our architecture. The old-world view of an application is transformed into new applications – volatile and continually morphing – combining sets of APIs that run microservices, and serve a particular business need at a particular point-in-time. These APIs and microservices will form the basis for whatever application we’d like to build on top of it. Architects need to prepare themselves and their organisations for an uncertain future, where technology’s evolution and businesses’ changing demands are not clearly known. By starting with a clear understanding of the essential building blocks, and the frameworks to re-assemble these in new ways in the future, one can architect for the uncertain future lying in wait. Platform 3.0 requires a shift towards “human-centered architectures”: where we start acknowledging that there’s no single version of the truth. Depending on one’s role and skill-set, and the level of detail they require, everyone will perceive the organisation’s structure and processes differently. But ultimately, it’s not about the user, or the technology, or the architecture itself. The true value resides in the content, and not the applications that house, transmit or present that content. Human-centered architectural principles place the emphasis on the content, and the way in which different individuals (from inside or outside the organisation) need to use that content in their respective roles. As the EA practice formalises intellectual capital in the form of business models and rules, we create an environment for machine learning and artificial intelligence to play an essential role in the future of the organisation. Many describe this as the future of Platform 3.0, perhaps even the beginning of Platform 4.0? Where this will eventually lead us is both exciting and terrifying.